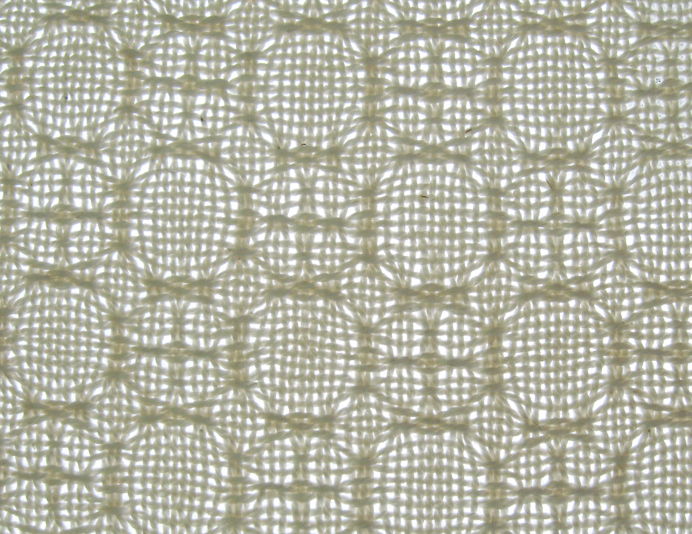 Many Lace and Spot Weaves are created by warp floats and weft floats on a plain weave background. 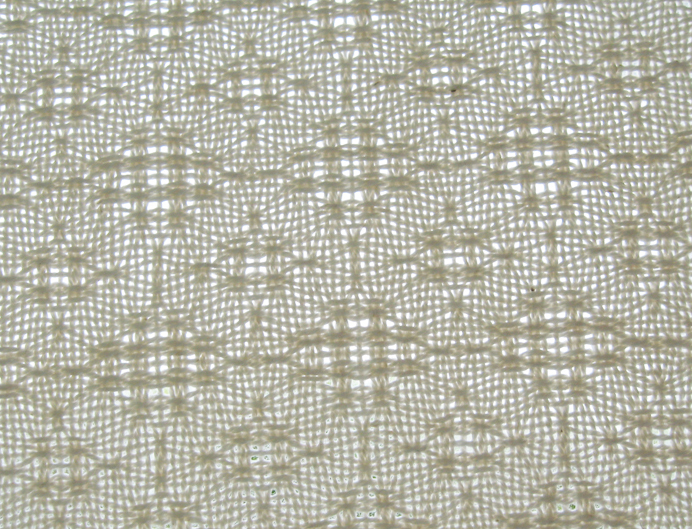 Lace has openings or holes and spot weave has closed spots. 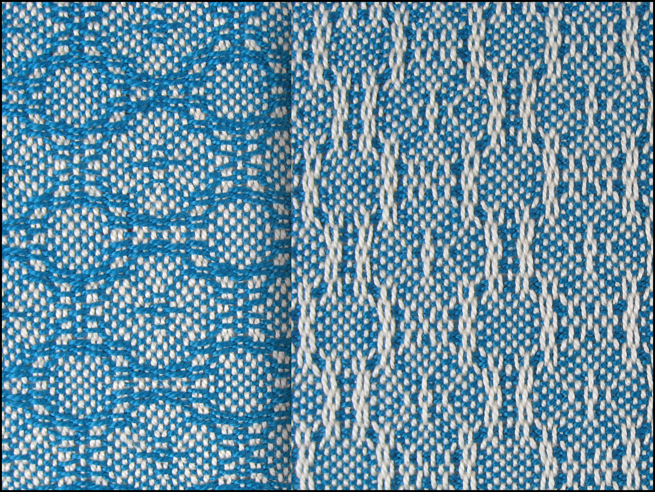 In my favorite book on weave structures, The Primary Structures of Fabrics, Irene Emery classifies Lace and Spot Weaves, including Huck, Lace Bronson, and Mock Leno, under float weaves derived from plain weave. 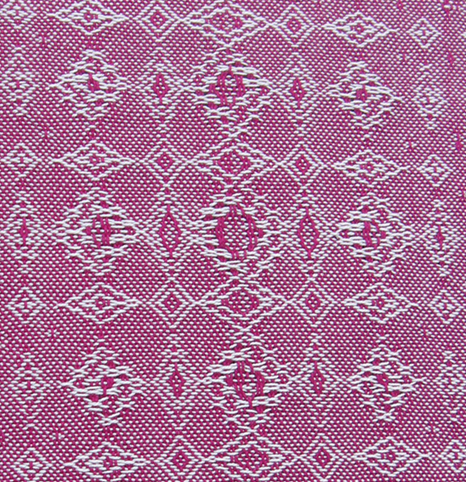 To a weaver a “float” often means a mistake, an unintentional skip of warp or weft that is longer than it should be, but floats are actually good in the case of a plain weave background patterned by areas of float weave. 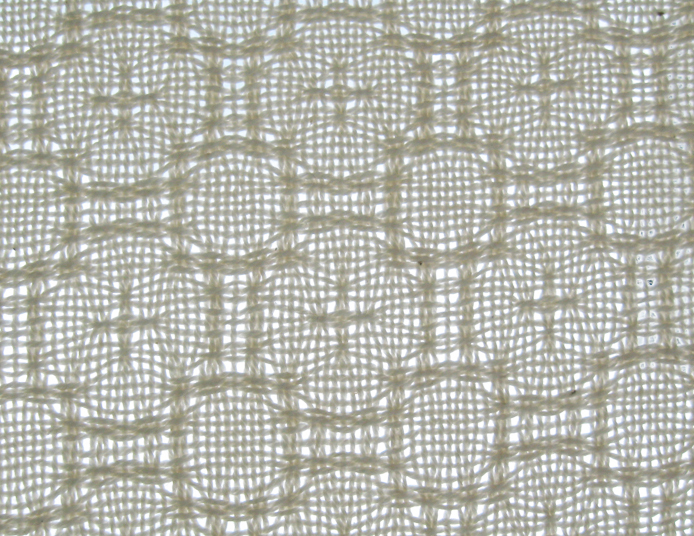 Having worked with Huck Lace and Mock Leno, I wanted to try something a little different using floats on a plain weave background. 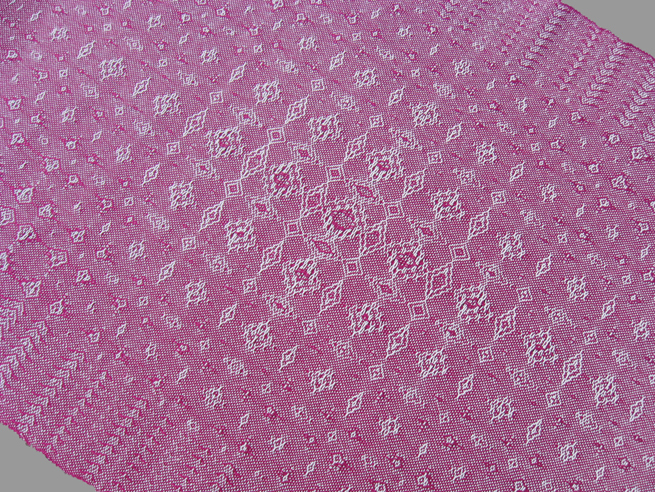 Instead of starting with a profile draft and using traditional blocks that you find with most Lace and Spot Weaves, I designed threadings and treadlings of unbroken point twills – similar to Gebrochene – with twill tie-ups and wove samples on 8 shafts and a fancier pattern on 15 shafts. I’m happy to share photos and drafts of my work, starting with the fancy one first. 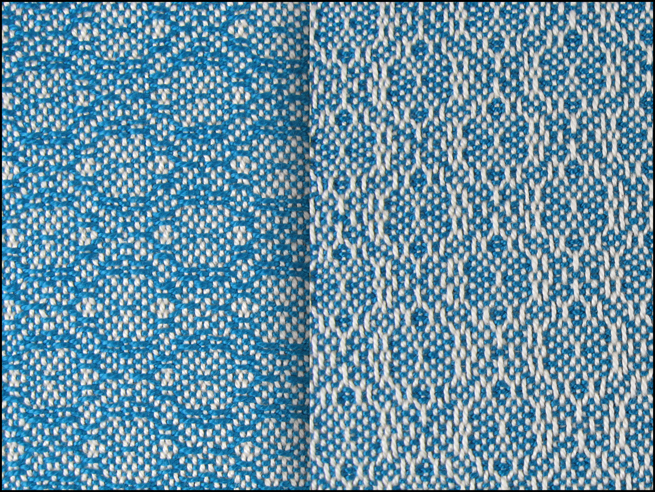 I wove four samples with a sett of 24 epi using off-white 10/2 pearl cotton for the warp and a bluish color for the weft. I wove four more samples using the same off-white for the warp and for the weft because I was curious to see how they would look when they are all white. 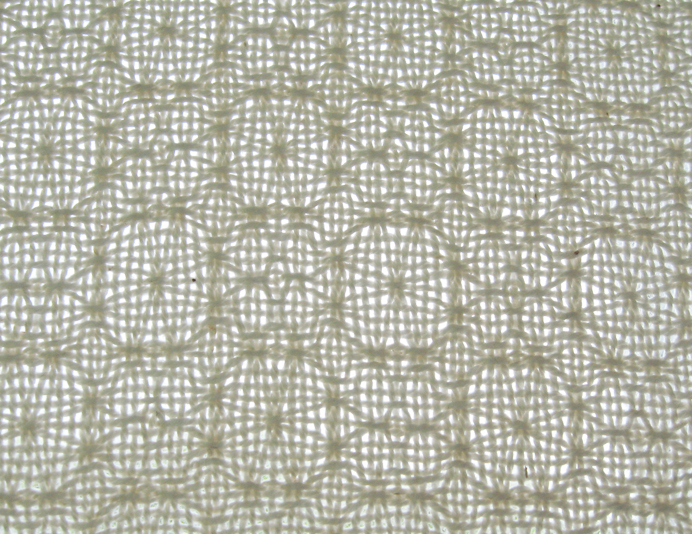 The amazing thing is how different the same weave appears when it’s all white. When you hold it up to the light you can see through it and imagine lacy curtains. Even more amazing are the areas where the yarn is deflected and curved into pleasing shapes. 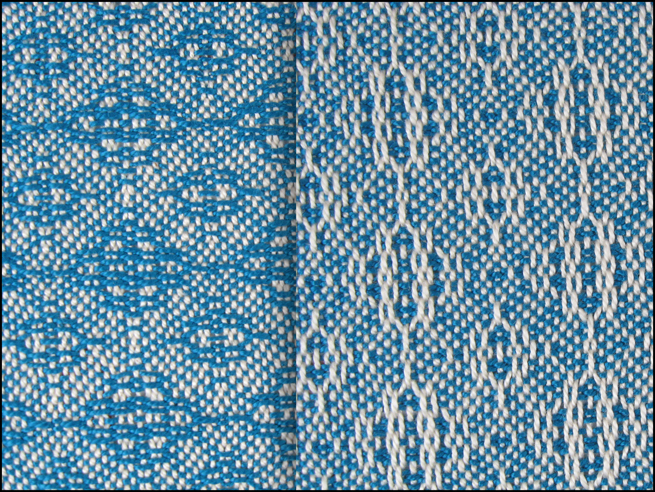 Wet finishing helps the warp and weft floats to draw together to create this effect. Following are the drafts and photos of the samples I designed. 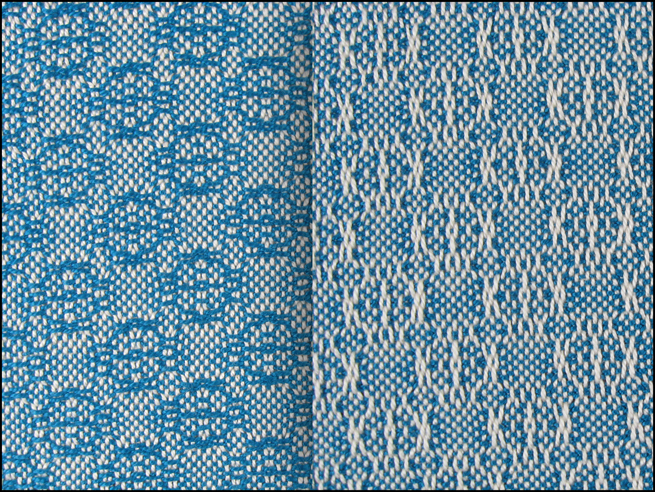 You can easily see in the photos of the samples with the blue weft that all the warp floats are on one side of the cloth and the weft floats are on the other side. 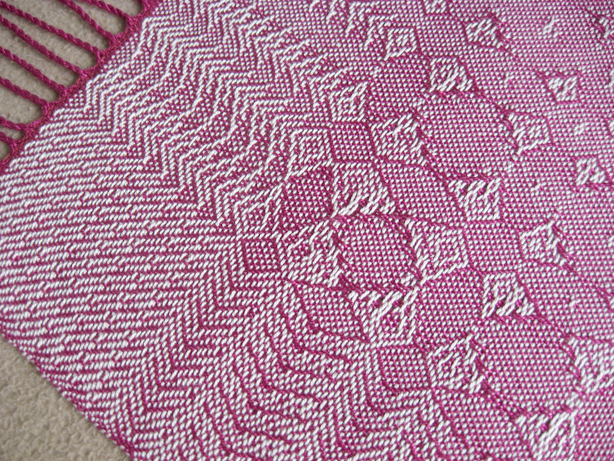 I photographed the all-white samples on an overcast day lit from behind by the natural light of the sky so you can see the lace and spot areas better as well as the areas where the yarn is deflected. Until next time, best wishes to all for a great summer and happy weaving! 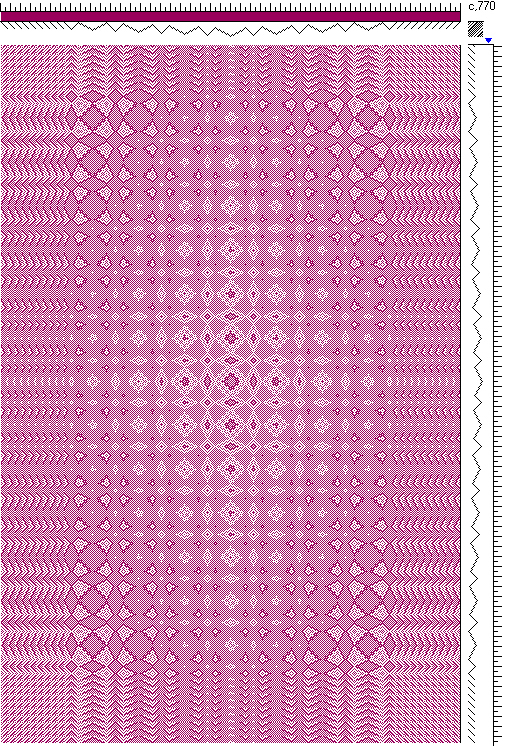 This entry was posted on May 21, 2014 at 8:06 pm and is filed under Lace Weaves. You can subscribe via RSS 2.0 feed to this post's comments. I can only say….. Oh! Wow! Beautiful! Oh My Goodness !!! You are an absolute inspiration and your work is simply stunning. You brighten my day every time I stop by to admire your weaving. Thank you for your generosity of spirit in sharing your work for everyone to admire. I admire your work very much! 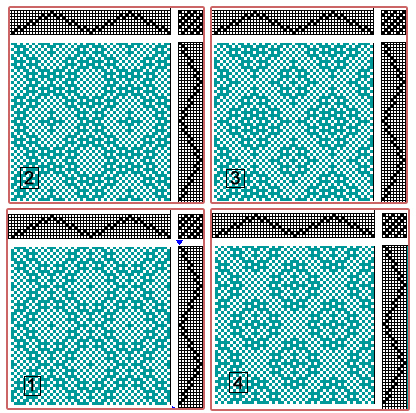 It is so nice to be able to see the different variations, very inspiring! Thank you and thank you to Belinda and Ruth…your comments are an inspiration for me to continue sharing my weaving adventures! Just lovely!! Thank you for sharing your thought process and the drafts. Lovely and very interesting! I enjoyed looking at the draft and each sample accordingly. There is so much to learn about what the effect will be on a project with certain changes – even something as simple as changing the color. Gorgeous! Your work is beautiful and i thank you for sharing it. I have to say thank you Valerie, Tania, Amy, Margaret, and Dorothy! I appreciate every comment.